This topic contains 11 replies, has 5 voices, and was last updated by dspruce 3 months, 3 weeks ago. 2. It would be great if I could export the highlights in different order–for example, it currently exports highlight in the chronological order of how highlights are made, but I want it to show the highlights in the actual order of the book [i.e., from page 1 to the end]). I also would like, if possible, you to enlarge the highlighter button. It happens to me frequently that I mispress the highlighter and highlight the texts in a color different from what I intend to use. Hi, could you look to add a manual pronunciation preference to your app, or instead make it obay the system-wide VoiceOver Utility Speech Pronunciation settings. I like listening to The Bible, and in your app, LORD is spoken as L-O-R-D and GOD as G-O-D. LORD, in is format, is written extensively thoughout, and it seems to be just your app that has a problem spelling the word out instead of saying it. Very much appreciated if you can fix this. I tried to send you the book, but I recieved a ‘Delivery Notification: Delivery has been delayed’ today. The original was too big to send, so this was the zipped it, but apparently still too big. I’ll set up a dropbox share of the book for support@macbookreader.com and do it that way. Let me know if you still don’t get it. What is the voice you’re using? Can you try to change it to any other voice? This reply was modified 1 year ago by admin. Yes, you’re right, it’s the voice. I’m using a non-Apple voice. It works fine with the Apple ones. It’s an odd one. 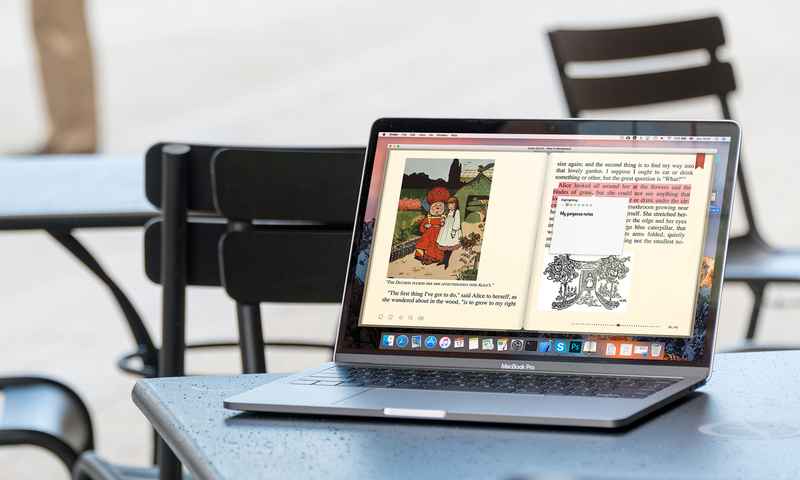 Very happy to have found this app — I’ve been using Calibre’s ePub reader for a long time and for the simple matter of faster loading alone, I love MacBookReader. I think the reading experience is really good; I just want to tweak some of the library features for now. Here’s the one I’ll put forward: I would be ecstatic if the sort order could go in either direction in the various views. Specifically I like my most-recently accessed books to show at the top of the shelf instead of the bottom. That one change alone would go a long way towards my feeling at home in this app. Nice app that would be even better if you could sync bookmarks, notes and highlights and last page read between Macs. A iPad version would also be great.